There are 14 Assisted Living Facilities in the Blue Springs area, with 5 in Blue Springs and 9 nearby. The average cost of assisted living in Blue Springs is $4,047 per month. This is higher than the national median of $3,346. To help you with your search, browse the 28 reviews below for assisted living facilities in Blue Springs. On average, consumers rate assisted living in Blue Springs 3.6 out of 5 stars. Better rated regions include Grain Valley with an average rating of 5.0 out of 5 stars. Caring.com has helped thousands of families find high-quality senior care. To speak with one of our Family Advisors about assisted living options and costs in Blue Springs, call (855) 863-8283. The city of Blue Springs, Missouri, is located in Jackson County, near downtown Kansas City. It has a population of just under 55,000, about 11 percent of whom are 65 and older. To meet the needs to this senior population there are four local assisted living facilities (ALFs) in Blue Springs and 17 nearby. Each is licensed as either an assisted living or residential care facility (RCF), with an RCF having the resources to handle residents who take longer to evacuate due to a disability. 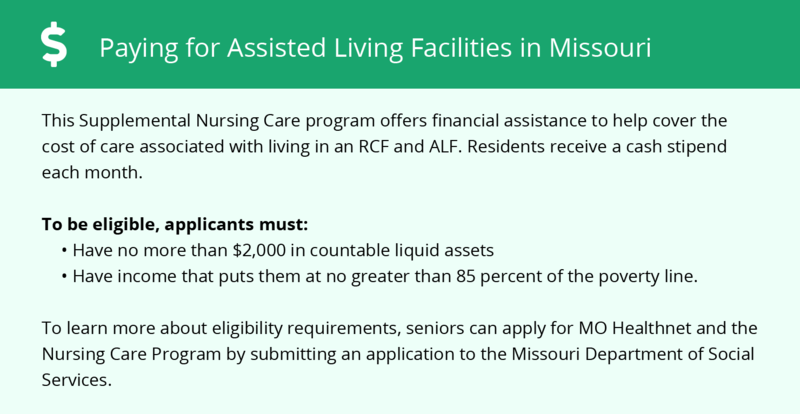 Licensing of ALFs and RCFs in Blue Springs, and all of Missouri, is conducted and regulated by the Missouri Department of Health and Senior Services. The cost of living in Blue Springs is a 93 compared to the national average of 100, making it slightly less expensive for seniors than in other U.S. cities. Most seniors can save on groceries, health care, housing and transportation, but may pay more for goods and services and any additional utilities not covered by an assisted living facility. Compared to other cities in the nation, Blue Springs is 20 percent safer and has a 73 percent higher crime rate than other Missouri cities. Violent crime rates, however, are lower than the national rate. Cold, cloudy winter weather is common in Blue Springs, where the temperature is typically 31 to 45-degrees. The summer average is 78 degrees. The Joplin area is home to world-class medical facilities, including Mercy Hospital, Freeman Hospital West, Landmark Hospital, and Freeman Hospital East, in the event of medical emergencies or illness. The air quality in Blue Springs is considered 16 percent worse than the national average, which may be a concern for seniors with a respiratory illness. Alternatively, those with severe allergies may thrive here. The pollution level is 83 percent better than other neighborhoods in the nation. Blue Springs has an array of community resources for seniors, including the City of Blue Springs Parks & Recreations, an organization that provides over 50 classes and programs at its local senior center. Assisted Living costs in Blue Springs start around $4,047 per month on average, while the nationwide average cost of assisted living is $4,000 per month, according to the latest figures from Genworth’s Cost of Care Survey. It’s important to note that assisted living rates in Blue Springs and the surrounding suburbs can vary widely based on factors such as location, the level of care needed, apartment size and the types of amenities offered at each community. 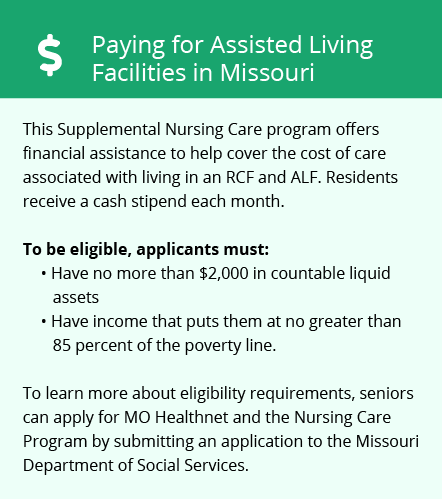 Eligible seniors seeking financial assistance in Blue Springs have options between the Medicaid State Plan Personal Care (SPPC) and Supplemental Security Income (SSI) program. To see a list of free assisted living resources in Blue Springs, please visit our Assisted Living in Missouri page. Blue Springs-area assisted living communities must adhere to the comprehensive set of state laws and regulations that all assisted living communities in Missouri are required to follow. Visit our Assisted Living in Missouri page for more information about these laws.